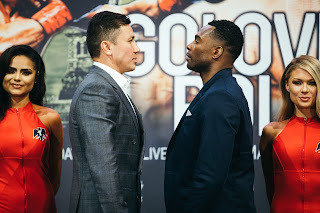 We would like to let our readers know that material regarding the Middleweight rematch between top contender Daniel Jacobs and former Jr. Middleweight world champion Sergio Mora as well as the Middleweight world championship fight between undefeated unified world champion Gennady Golovkin and Welterweight world champion Kell Brook is currently in the works and will be released on Wednesday, September 14th. Stay tuned. "And That's The Boxing Truth."